Who says that about themselves? Ep06 somehow began with Haruka writing/talking to her grandmother, about how the day she had long waited for had finally arrived. I found it hilarious that this was the first time she was talking about the fact that she wanted to go to Hayato's concert; up until now, she had only been talking about wanting to compose a song for him. 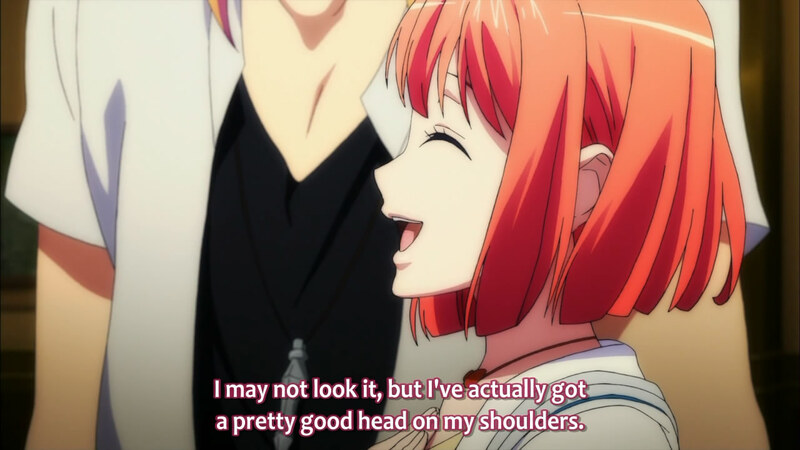 Anyway, the group (Tomo, Otoya, Masato and Ren) made fun of how she would most likely get lost, and many offered to go along with her - however, explaining that she would surely be okay, Haruka ran off into Tokiya's arms...by which I mean that they coincidentally "bumped into" each other. He picked up her Hayato CD and advised her to be careful, walking off into the sunset. Everyone wear eyeliner/mascara under glasses. Once in the "big city", Haruka of course got lost and of course no one would speak to her...and then she saw Natsuki sitting on a bench, writing in a notebook. Very typically, he was extremely angry-face when she spoke to him, appearing nothing like his usual self. At this point, I assumed that he just got very engrossed with his composing and became highly irritable (I mean, being happy all the time is hardly a characteristic) - that would have been better than what reality was. I was made to sit through a random scene of just how violent this man was, when two passers-by accidentally tossed a wrapper onto his head and he chased them down, shoving the wrapper into the offender's mouth. I mean, the act of flippantly tossing garbage, missing the trashcan, and accidentally hitting someone is stupid and rude enough, but shoving the wrapper into someone's mouth? Really? Really? The ducks! Spare the ducks! Sho showed up, equally randomly, and quickly put Natsuki's glasses back on...at which point he became normal again. I cringed. A lot. It turned out that Natsuki, since the time that Sho had known him, had some kind of DID, turning into an alternate personality (named Satsuki) whenever his glasses were taken off. I'm so tired of anime/manga using DID in comedy. I wouldn't mind it so much if they even once alluded to the fact that in a lot of cases, people diagnosed with it need medical help. Natsuki, being as violent as he is when he's Satsuki, definitely needs it to be controlled. I understand that's a downer in comedy, but why the lack of serious handling of this topic in non-comedic presentations? Blah. I guess it just bothers me because I didn't find it funny in this case. (I'm aware that OreTsuba talked about how the main character needed to go to the hospital for treatment due to his DID, and I praise it for that.) On a comedic note, would contacts be moot on Natsuki? It's the feel of glasses that drives Satsuki away? His chi defies the forces of gravity. Natsuki and Sho decided to follow Haruka to the Hayato Concert, because a Piyo-chan Concert was set to occur after (of which Natsuki was a great fan and Sho was tagging along to keep watch). There was cryptic mentioning of Hayato needing to "take" something, and Haruka noting that he didn't sound the same, and then he dropped the mic onstage and froze instead of picking it up. 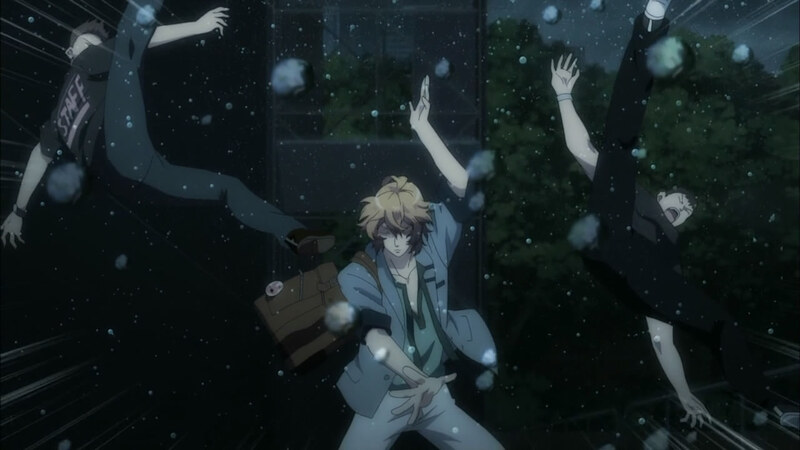 It was setting the stage for something pretty obvious, but first Natsuki's glasses had to fall off (and shatter). Such an act caused him to take on Hayato, since he was a genius composer as his alter ego, and he jumped onto the stage (after all the fans ran away screaming). 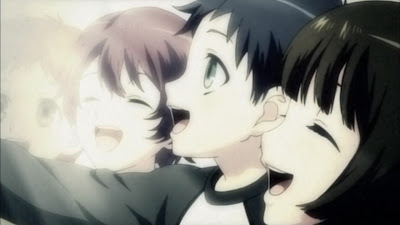 Hayato, for his part, let Natsuki/Satsuki sing and the group back home watched on TV. That's some nice publicity for a pre-debut hopeful. Are those even really glasses...? Haruka attempted to get his broken glasses back to him, but it didn't work and instead she was "trapped" in his embrace. I kind of zoned out as they entered some kind of "nirvana-based" world and Haruka professed that she wasn't scared, because she knew he wouldn't do anything (rivalling the stupidity of Asuka's actions in OreTsuba, sadly). Natsuki/Satsuki secretly revealed that he was already in love with her (although that much was obvious from earlier in the day, when he compared her to the sun). Using the distraction, Sho ran up and pushed Natsuki's hat down, causing Piyo-chan's glasses to cover Natsuki's eyes, and all was well again. Oh, there was one more thing: apparently, the guy singing was Tokiya. 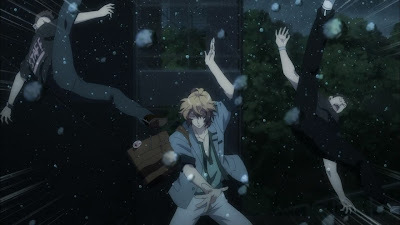 When he caught Haruka as she was falling, he walked away with a limp, with the same foot bandaged as Tokiya had in the earlier scene. 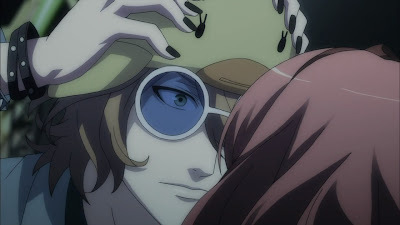 It's funny how much attention Tokiya got in an episode dedicated to Natsuki, as if anyone had any suspicions that he wasn't her main love interest. 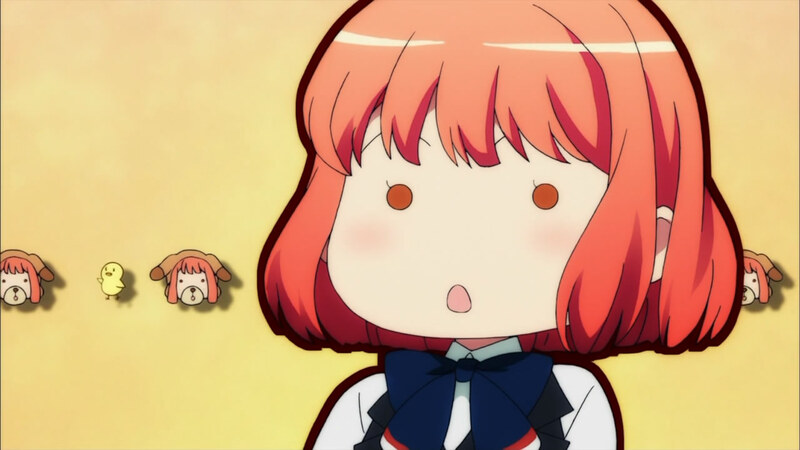 Another strike against Natsuki is that his alter ego scared Haruka and it wasn't she who "fixed" him, but instead Sho. This isn't a "serious" shoujo, so she can't really end up with someone that isn't "perfect". Annoying as it may be, that's usually how this kind of "flowery" shoujo works. The childhood friendship of Masato-Ren and Natsuki-Sho already took them out of the running, but this extra detail about Natsuki makes the situation worse. Of course, even the writing shows just how infatuated Haruka will be with Tokiya, so this is all just extra noting of mine. Aren't both those girls looking at that guy? Secret romance?! 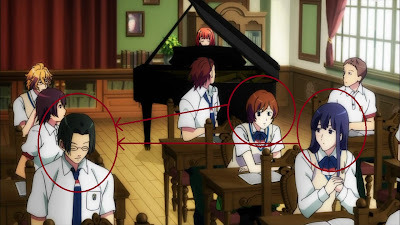 Ep07 began with a clip of Haruka playing the piano in front of the class, signifying that whatever problems she had were in the past and she (along with the anime) was ready to focus all of her energy onto the Tokiya/Hayato situation. It's pretty amusing to see the class, as a whole, reacting to her playing. Is it really that surprising that someone admitted into a music school would be inclined in some form of musical expression? Either way, the Natsuki/Satsuki incident was pretty much forgotten as Haruka mulled over whatever was wrong with Tokiya (to the point where even Tomo noticed that she was out of it, although Haruka usually seems pretty out of it, what with talking to her grandmother all the time). Why are Sho and Ren - amongst other random classmates - watching him? When Haruka "confronted" Tokiya, she revealed that she knew at the concert, upon seeing his leg, that he was actually Hayato. I was sincerely surprised by this; I had genuinely thought that they were two different people. Tokiya (as I will remain calling him until he returns to his old name) brushed her off and headed off to his random singing test...which he failed, once again because he had no "heart". 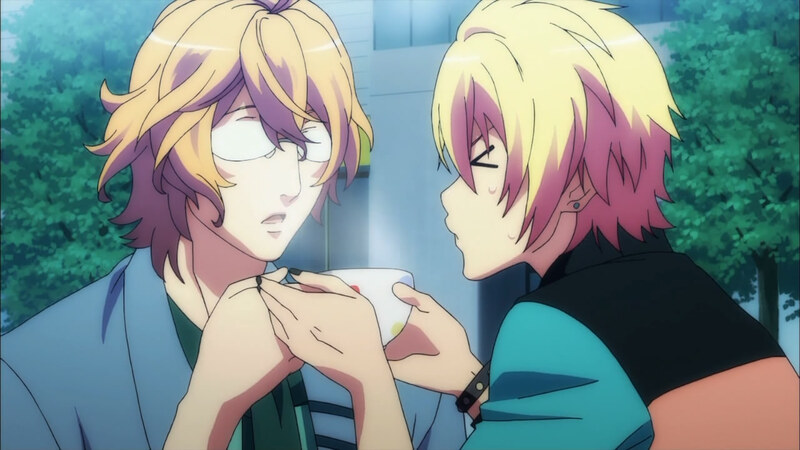 Ryuya-sensei then upheld his promise to kick Tokiya out of S Class, since he clearly didn't belong there. I find it sad that Ren can skip all of his assignments and miss the final deadline (even if by just moments), and have to face no repercussions, simply because he's "talented" or "has heart" or whatever BS reason the anime has. I can't believe I'm annoyed by this so much, because I know it's true in the real world, but way to blatantly show preference to people with talent. Even Haruka turned out to be a "genius", since she knew music without officially learning it, so really? That's a little annoying. Translation: You have a pretty face. Use it. The reason for Hayato posing as Tokiya (whether or not there actually is a twin brother is a little questionable; people speak as if there is, even those that know of the posing, but that may just be an intricacy of the Japanese language) was apparently that he wanted to change agencies and focus on singing. 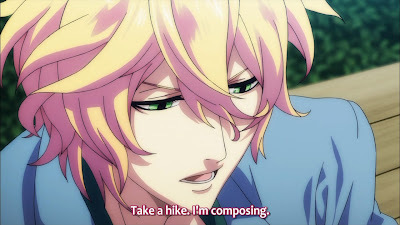 His current agency, along with his Evil Manager Who Wishes Him Harm, has been pushing him as an idol and not really a singer, to the point where his new song won't be getting an official release and neither will Tokiya be getting the concert he was promised. Upon returning to school after finishing his day's idol-work, he was informed by the principal that everything was failing. The principal, apparently, had been the one that didn't want Tokiya's talent to be wasted and so he accepted him into the school, promising to help him change agencies. 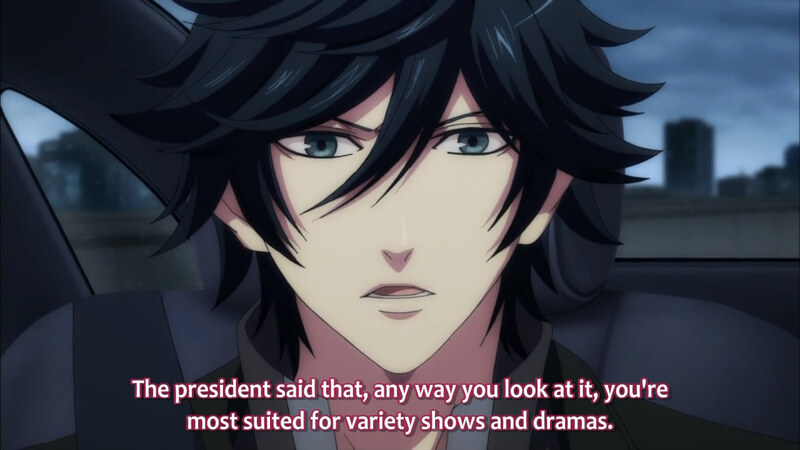 However, due to Tokiya's lack of performance (wouldn't you have known his performance levels when accepting him?! ), he was "reneging" on his "promise". I find it hilarious that Tokiya's just getting pulled this way and that by various Evil People Who Wish Him Harm. There's just always some random children involved, isn't there? 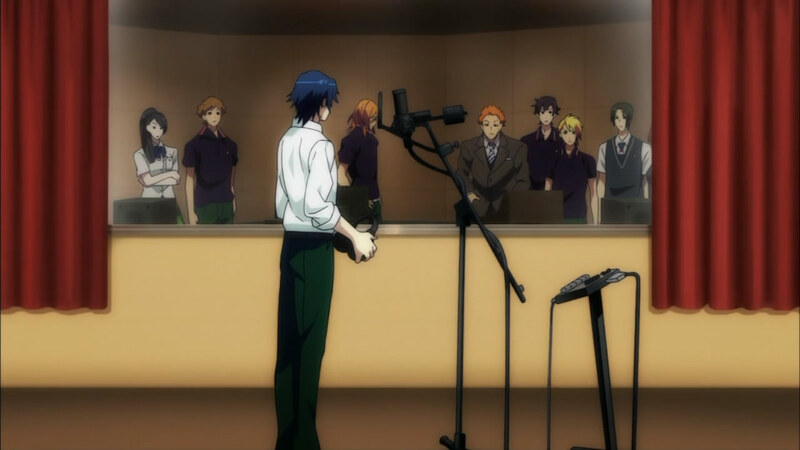 Unfortunately, as was found out during his insert song, Tokiya's problem stemmed from the fact that he can sing "with heart" as Hayato, but failed miserably as Tokiya. What the hell does that mean? I'm quite confused. It's not as though he made up the Tokiya personality to cope with something - yes, he's been coping with his oppressive job, but it's clear that pretending to be "the younger twin brother" was just to make sure he wasn't caught, not as a way to escape. ...unless it was a way to escape...? The lack of information is confusing and, in another world, I would sympathize with him - but not now. I'm just really confused. Maybe next episode will make it better. I would like answers to the following questions, in any order: Why does Tokiya hate Hayato? Why is Hayato bound to the principal's evil ways? Why can't Hayato, being so popular, change agencies on his own to be a singer? Who were those children? Why can't he sing as Tokiya? There's probably more, but I doubt even this much will be answered. Okama are so amazing. Butterfly transformation? No problem! 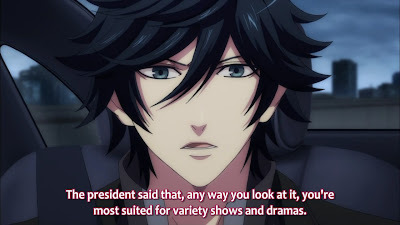 The episode ended with flashes of Tokiya in A Class, being pretty much shunned and gossiped behind his back for "failing" out of S Class. (I'm actually surprised that no one has approached him in order to get into Hayato's good books, seeing as how he's the "younger twin brother" and no one questions it.) Being emo-face with the one person that seemed to genuinely want to help him, Haruka was relegated to glancing at him when he wasn't looking. The final words were about the upcoming Summer Camp, which would be for training. Upon the return from "vacation", the idol-composer pairs would be made. I'm curious as to what would happen. The preview said that Haruka would get paired with 5 idols - given that Tokiya is the only one that "stands out", I think he'll be the one excluded. Will Haruka and Tokiya bond during the Summer Camp? Is Tokiya already in love with Haruka? Did the preview lie and she'll actually pair up with just Tokiya? Oh, wait, those are more questions. I guess she knows just as much as I do. So, all in all, this batch of episodes left me with more questions than it answered. Like I said before, I didn't expect that Hayato and Tokiya would be the same person. This doesn't hinder things in any way, though; Tokiya is still her main love interest. It's even more "perfect" now that all of her feelings for Hayato can easily shift to Tokiya...because, you know, they're the same person. Moreover, it's pretty clear that Tokiya's problems will take over the rest of the series; should he and Haruka pair together, it'll be all about debuting together so that Tokiya can be a singer and not an idol. Should the other boys be a part of the grouping, even then it's fine; Haruka can help the group (the ED already displays them as one, after all) while still being with Tokiya. 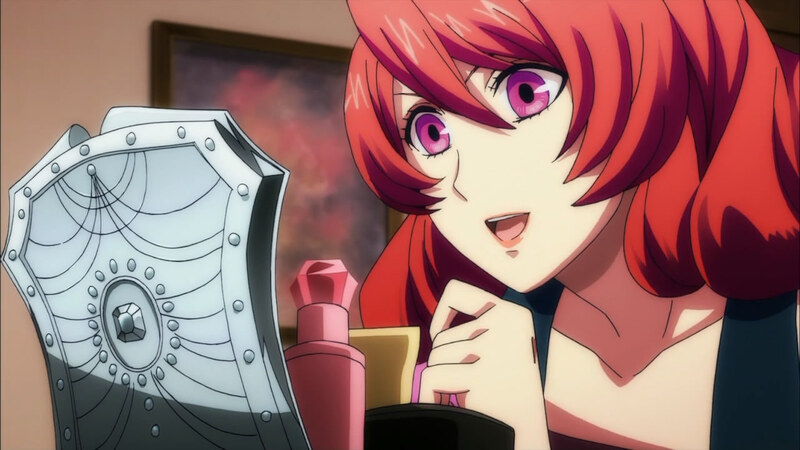 I still have no idea where Otoya fits into the equation, since he really doesn't get enough screentime to be on my radar but his story is setting up well enough to be the actual rival in the love story. Why not use a bigger mirror? Or why not stop blocking this small mirror? 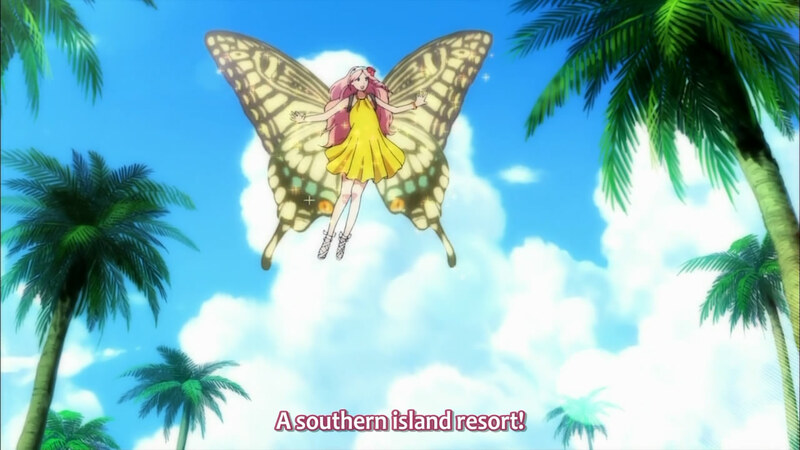 I'm assuming the next batch will have a beach episode. 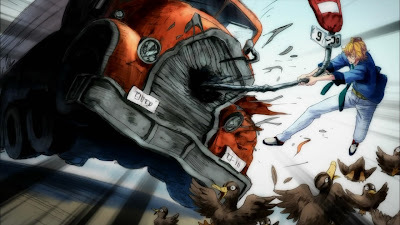 I hope this isn't the kind of anime that adores ultra-thin boys with their ribs and other such bones sticking out; I don't want to have to sit through an episode of that. 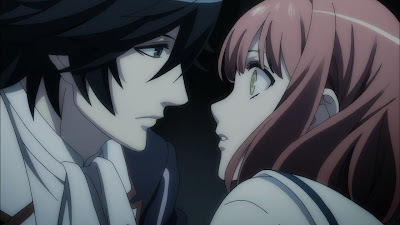 I do also hope that Haruka/Tokiya fall in love soon, though I doubt anything will come of it (except drama). If they'll end the anime by getting together, I think the climax will have something to do with, considering it's forbidden. Ah, this anime is so silly.